Searching for answers when your little one is sick can be very frightening. From the whirlwind of radiologists and nursing staff coming in and out to the battery of tests and scans, diagnostic imaging for a child of any age can create a lot of anxiety. We understand the complex range of emotions during this time, and our local imaging center is here to help. North Pittsburgh Imaging Specialists is proud to deliver caring, accurate services that aim to provide the most comfort for your little one during this scary time. As a quality provider of pediatric imaging services in Pittsburgh, we work to deliver to the best results in a professional and affordable manner. Our affordable imaging services can prove to be very beneficial for children in need. Be sure to contact our radiologists today to learn more and to schedule your consultation! Diagnostic medical imaging at any age can be frightening. Our imaging team is here to provide knowledgeable guidance and pertinent information through every stage of your care plan. We will be happy to address your questions and concerns in an open, honest manner. Ultimately, we want you and your child to be at ease and feel in control throughout the process. We have the most modern equipment when it comes to CT scans, X-rays, ultrasounds, MRIs, and more. This gear is combined with our top-notch training to allow us to provide the most effective outcome for your family. Call us today to learn more about our modern imaging services! The idea of undergoing an MRI without insurance may cause you some stress, and we understand. 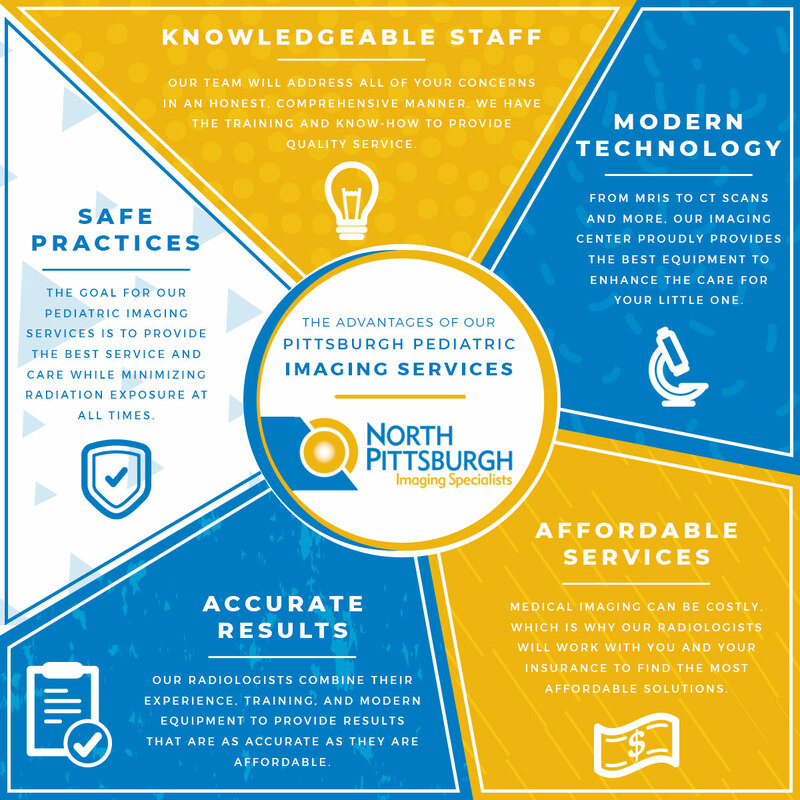 The team out North Pittsburgh Imaging Specialists specializes in creating cost-effective solutions for our customers of all ages. Our radiologists will be able to work with you in a clear, honest manner to find an agreeable price point to allow you to focus on your child’s health, not the bill. We can work with high-deductible plans and those with no insurance to create an effective solution. What is the value of imaging services if they aren’t accurate? Our radiologists have the experience and training to provide clear results for your diagnostic imaging services. We know the best practices, and our team has received specialized training in pediatric imaging to get the job done. Every aspect of our pediatric imaging services is tailored to be as minimally disruptive as possible to your child’s health. By combining our modern technology with the best training and practices, our team works to create a plan for your child that minimizes their exposure to radiation as much as feasibly possible. Pediatric imaging services are much more restricted in terms of radiation tolerance, and we’ll work to the best of our abilities to enact a quality plan that delivers the best results with minimal radiation. North Pittsburgh Imaging Specialists is proud to be your source for diagnostic imaging for all ages. Our team is proud to be Pittsburgh’s imaging service experts, and our dedication to quality shows in the smiles on our patients’ faces. Contact us today to learn more and to schedule your affordable imaging!